The Hafeez Karamath Group is pleased to announce the opening of applications for the 2014 edition of the ‘Hafeez Karamath Journalism Fellowship’. Firstly awarded in the year 2010; the biennial journalism fellowship was created in an effort to promote and expand the unique ethos of Trinidad and Tobago on an international scale whilst at the same time uplifting the standard of journalism. This 3rd edition of the fellowship will be under the broad vision of “The Economy of Trinidad & Tobago in 2020: A Futuristic Vision”. This fellowship is instituted exclusively for print media and mid-career journalists. Journalists are encouraged to apply for this biennial USD 1500.00 fellowship. Send us your project proposal in no more than 500 words with a short biography in English and a recent high resolution working still to hr@hafeezkaramathlimited.com, no later than Friday 27th June 2014. Please note that late submissions will not be entertained. Hafeez Karamath Limited and the Desalination Company of Trinidad and Tobago (Desalcott) have added to their list of social endeavours the co-sponsoring of famed T&T Pro League football club; San Juan Jabloteh. The official announcement was made at the re-launch / re-branding media conference held at the Queen’s Park Oval. Speaking at the media launch; the Group’s representative, Aleem Mohammed, said that the co-sponsorship agreement would see the Hafeez Karamath Group being primarily the provider of sport nutrition for players. 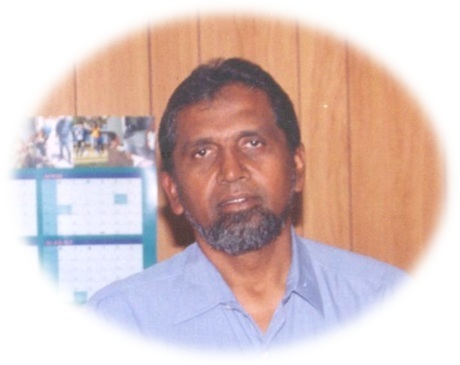 Mohammed went on to say, “Within recent years, the Hafeez Karamath Group and Desalcott have added to its list of civic ventures the financial backing of various professional and amateur sporting organisations throughout Trinidad and Tobago; be it in the frame of sole financial sponsors and or co-sponsors. We are therefore pleased to continue along the same vein and we are enthusiastic about part sponsoring San Juan Jabloteh, who also operates out of the same locality as the Group’s Head Quarters”. In his feature address Chairman of San Juan Jabloteh, Mr. Jerry Hospedales reserved special thanks for the group of sponsors. In commenting on the Hafeez Karamath Group Mr. Hospedales said “the provider of meals and camps being the Hafeez Karamath Group and I wish to thank the Group for its support”. Part of the sponsorship agreement would be the logos of HKL and Desalcott branded on the senior and reserve (under 18) teams playing kit. San Juan Jabloteh, who celebrates their 40th anniversary in May 2014, has distinguished themselves in both football and net ball having amassed an impressive total of 51 trophies in their competitive divisions. They have also produced a long list of former and current national players for the T&T ‘Soca Warriors’. to celebrate the acquisition of 100 percent shares of Desalcott. The Desalination Company of Trinidad and Tobago (Desalcott) is now an officially 100 percent locally-owned company, after majority shareholder, Hafeez Karamath Engineering Services Limited (HKESL), recently acquired the 40 percent shareholding of US-based firm, General Electric (GE). Desalcott originally had the responsibility to design, build, finance and operate the US$200 million desalination plant. 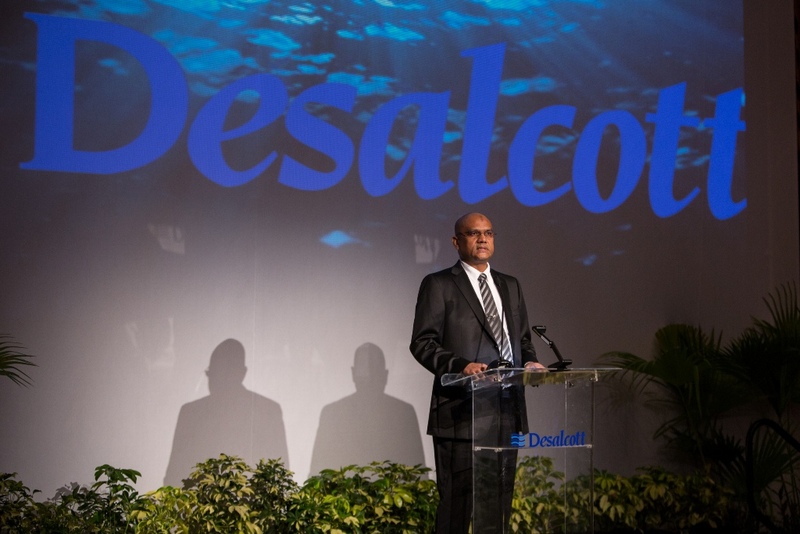 Mr. Yashmid Ellis Karamath, Executive Chairman of Desalcott, made the disclosure at a dinner held last Friday at the Hyatt Regency (Trinidad) to celebrate the acquisition. Mr. Karamath pointed out that the original shareholding in Desalcott comprised 60 per cent owned by HKESL and 40 per cent owned by Ionics Ltd, a United States-based desalination company which was later acquired by American giant General Electric. Mr. Karamath said negotiating the acquisition took two years and recalled, that getting to this point � final transfer of share ownership which became effective on November 6, 2012 � was tough at times. �All of you who have been there with me for various aspects of our negotiations with GE probably still carry some bruises, but in the end, through hard work, persistence, prayers and the grace and blessings of God, we prevailed,� Mr. Karamath said in his address. chats with Mr. John Thompson, General Manager: Desalcott. He also highlighted that the 100 percent local ownership of Desalcott was the realization of a dream held by the late Hafeez Karamath, former Executive Chairman. Mr. Yashmid Karamath said Desalcott was the brainchild of his brother, Hafeez, who �worked tirelessly to transform his vision into a reality. He brought in the relevant expertise in desalination in the form of Ionics Inc, sought local financing through Republic Bank Ltd and the Republic Finance and Merchant Bank, and constructed the plant at Pt Lisas�. 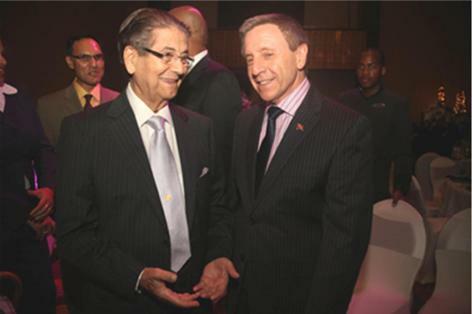 �It was his dream that Desalcott would one day be 100 per cent locally owned and operated and that the plant�s capacity would be increased to provide more desalinated water to the general public of T&T. His passing was a tremendous blow to myself, my family and the HK Group. His imperative of sole ownership and growth became my mission to complete. Desalcott is currently ranked within the top ten most successful plants in the world. It is my vision that within the near future, Desalcott would be the largest desalination plant in the world,�Karamath said. Among those in attendance at the celebratory dinner was the Hon. Emmanuel George, Minister of Works and Infrastructure, Dr. Anthony Sabga, Chairman Emeritus of the ANSA McAL Group, Mr. Richard Sammy, Regional Manager: RBL Investment Banking and other distinguished specially invited guests.